Okay, now the headings for this experiment have officially begun to confuse me… why Round 2… Could this be Round 1 part 3…. In any case, we are getting somewhere. Today was single Sausage Egg McMuffin Day, also known to Dan as the worst day of his life… Seriously, getting him to eat 3 and a half donuts was the easiest thing ever, but only one Sausage and Egg McMuffin… you would think I was killing his cat. Remember, we have eaten a large calorie mostly balanced meal and a large calorie mostly carb meal . We varied the amount of carbs as both an absolute and a percentage. Now we are going to eat a regular sized fairly balanced meal, and a regular sized mostly carb meal. We will see how our blood sugar reacts to all 4. Unfortunately there was no ceremony with this day, no pomp, no laying the food out on the bench and posing with it before eating it, no photos, nothing. Just simple take blood, eat food… It was kind of sad. I will track down some stock photos to fill up the page so it isn’t all graphs and words. As well, there is the concept of satiety-of fullness-that needs to be addressed. It was sort of unnecessary to acknowledge that the previous 2 meals kept us full for at least 4 hours. They did. I even checked with Dan and he agreed. 2 SEMcMs or 3.5 SGD (Sugar Glazed Donuts) fill you for a surprising amount of time. That really is to be expected with an 870 calorie meal. The challenge as we continue down this blood testing road is to find meals that stay in the healthy zone and still keep us full for 4 hours. Obviously we are going to be testing the limits because I am fully aware that a Kale salad and a petite filet with asparagus is going to stay under the blood sugar level and will keep me full. The interesting stuff to experiment with is the easy to grab food that we eat out of convenience when we are out or at work. So, we are doing a self reported full scale with the blood sugar. I will go back and edit that into the results and will keep track of it moving forward. Same as in Round 1 Part 1 and Part 2. 1 Sausage Egg McMuffin each and a large coffee. Dan’s black, mine with milk. Mark reported feeling full. Dan argued for the first little while that he may have been hungrier after eating the SEMcM than before. Note, we did get an hour late start on the experiment today and Dan was famished when we started. Dan continues to have elevated blood sugars in the morning. He isn’t getting enough sleep so this may be the cause. There is a little documentation of elevated blood sugars in normal people who get less than 6 hours of sleep a night. Will find a citation. Mark, still full. Dan admits that he may not be hungrier than before he ate the muffin, but he sure isn’t any less hungry. He is famished. A couple of things. Certainly I absolutely absorbed the SEMcM with no harm at all. Dan’s blood sugar actually went down!! I will discuss this in the discussion section, but seriously, why did I have to recruit a freak for this experiment. Mark, still full. Will be for another hour or 2. Dan, still hungry and is now planning lunch, which he will eat within the half hour. 3 slices of fresh slice. Blood sugars are looking good people. Dan is way below his fasting blood sugar and I may as well be back there. This is good looking blood results from both sides. As you can see in the chart above, the blood sugars are entirely within the healthy zone at the first post meal measurement. Again, Dan’s post meal blood sugar is considerably lower than Mark’s. The main thing to note is the odd drop in blood sugar for Dan post meal. We have been using an estimate of peak blood sugar at 45 minutes for an average healthy individual. This is just an estimate and I believe with Dan it is wrong. I believe he is hitting his peak blood sugar on these processed food meals way sooner, quite possibly as soon as 15 minutes. This is another test for another day, but when you place a peak at 15 minutes to 30 minutes (as shown in the light blue dotted line) his blood sugar numbers look much more realistic. In any case, as predicted, blood sugars are much better than the 2 SEMcM’s as can be seen in the chart below. Of course even the 2 SEMcM’s were much better than the 3.5 SGD (sugar glazed donuts). Satiety was considerably different though. I normally don’t feel full with one SEMcM, but during this test it was different. I haven’t been feeling very hungry the last week or so, so that may have been the reason. I did have a huge lunch after the SEMcM and I have noticed a pattern of this, so it is possible that the SEMcM is increasing my cravings. Dan felt no satiety at all. He actually had his lunch 2 and a half hours after this experiment and he went for 3 slices of Fresh Slice Pizza which allows us to compare our 3FSP numbers. That will be posted shortly. Overall I was surprised that our blood sugar was as balanced as it was after the fast food breakfast sandwich. This indicates a number of things. First, that if you can be full on 1 SEMcM, then this is not a bad meal for your blood sugar. 2, that it is highly likely that the breakdown of macroingredients in the SEMcM is about what McDonalds is saying in their nutritional information. That is an intriguing thing about the blood sugar measurements. Once you know how your body should be responding to certain foods, it can be quite disturbing to find out that it isn’t. If the measurements are correct, you have to take a second look at the nutritional information. Unfortunately, the nutritional information on some foods can actually be wildly off. That is what happened at Fresh Slice and this next report reveals some VERY disturbing things happening at the fast food pizza chain. We decided to give our pancreases a few days off to recharge. Apparently the entire weeks food activities can effect any given days, so a few days off is the least we can do after the Sausage Egg McMuffin fest. Before we get down to the part of round 1, I would like to propose that 2 Sausage Egg McMuffins and a large coffee become our standard test. This will be our baseline. We are looking to add a few new test subjects to the pool, so we can all get a baseline using the Sausage Egg McMuffins. As well, I am going to invite everyone reading this blog to join in on the experiment. I will link the call out here. I think in the future, when asked, what is your SEMcM score, people will just say 5.0, 7.0, 6.5… or 4 hours to get back to baseline… I think it might be a better measure of the likelihood of developing diabetes in the next 5 years than any other. Mind you, if you answer, I can’t get my SEMcM because I never eat junk food, odds are diabetes isn’t in your immediate future. The other thing I want to talk about is science. What we are doing isn’t quite science…. well, it is science, but it is not good science. So often we hear reports in the media that a study proves that x is bad for you, or y is good for you. The truth is, science is a body of information (technically it is the way in which we get that knowledge, but don’t worry about that for now). No one study will ever prove anything. Ever. Even a well designed study is only one part in a growing body of knowledge. It is only valid within its context and is limited in how you can extrapolate it to the general public. The smaller your sample size, the less applicable your findings are to the public as a whole. Our sample size is ridiculously small. As well, the less controls you put on all of the variables, the less you can attribute your results to the variable you are varying. Our experiment is very loosely controlled. So, with that said, there is still tremendous value in the results we are getting and the experiment we are running. Still, for any individual, the best thing you can do is get your own blood sugar meter and find out the foods you shouldn’t be eating by getting to know what causes spikes and what to eliminate from your diet. So, as with Part 1, a number of things went wrong. At 7:30 I was driving through the drive-thru while Dan was texting me a picture of the donut cabinet at 7-11. Plenty of glazed donuts, no problem there. Unfortunately McDonalds didn’t work out as well, as they would not make me french fries for breakfast. I thought I read somewhere that they were going to have dinner items available at breakfast and vice versa, but that was probably just a dream… a cruel cruel dream. So, my plan for french fries will have to wait, but I think this is good as it keeps Dan and I eating the same things, which is probably best for the experiment. I got us some large coffees to keep as much consistency in variables and headed off to get my half of the donuts. I didn’t really think that 3 and 1/2 donuts was a lot. I mean I knew it was a lot of bad, but I didn’t think it was a lot of food. It is. It is a ton of food. You have no idea. After choking back the last of these donuts, I think I am completely cured of my love of donuts and I am reminded of reading Mrs. Piggle Wiggle as a kid. Who knew that those techniques really worked. We got down to eating these and Dan just plowed through. I still had one and half to go when he finished up. I don’t think I have ever seen Dan so giddy. As soon as he was done he was running around getting the gym ready. It was such a chore to eat these donuts. I don’t want to belabor this point, but really, 3 and 1/2 glazed donuts is a disgusting meal. You can see the joy on my face… BTW, I had to take a selfie as Dan had already run off to do something. On a side note, this is 7:45 in the morning. We aren’t looking our best but are willing to put ourselves out there for science. Don’t judge. To recap, we each ate: 3 and 1/2 7-11 glazed donuts. They are 250 calories each. The meal had 38.5 grams of fat, 119 grams of carbohydrates, and 10 grams of protein. 22% fat, 71% carb and 7% protein. 40 grams of the carbohydrates were sugar. This time I was more prepared and we got our fasting blood sugars. I hadn’t consumed anything at this point, not even a sip of coffee. Dan was the same. We should both pull 5.0’s or thereabouts. I did my blood test first and came up with a 6.7!! Seriously, a 6.7! Dan was laughing and making fun of my reading until he realized that he might be jinxing himself. Spoiler alert, he was. Dan pulled an astounding 7.8! Before eating a bite. We couldn’t figure out what went wrong. How could we have contaminated the equipment? These were unprecedented numbers for both of us. Totally out of the range. My reading wasn’t entirely surprising to me as I had been at my favorite Christmas party buffet dinner the 2 nights before and had eaten so much food I had gotten the meat sweats. I had a fair bit to drink too, but there was no good reason for Dan’s results. That was just my first plate too. Then of course it dawned on us. We had been handling these sugar glazed donuts. Our fingers were covered with sugar. That sugar was mixed in with the blood. We were laughing at how stupid we were and quickly went off to wash our hands and try again. What a relief to figure out how badly we had messed with the experiment. A few minutes later, we tested again and my measurement had gone up to 7.0!! Dan’s stayed at 7.8… I can’t explain this… Could our livers be dumping huge amounts of sugar into our blood in anticipation of the donuts? We both were very excited at the start to eat these. Dan was more than a little excited. He was like a kid on Christmas morning… This is something for a future experiment. How does anticipation effect blood sugar readings? Dan pointed out that the liver pushing sugar into the blood is the opposite reaction you would expect if your body was getting ready for the donuts. Wouldn’t it pre-flood your blood with insulin. We both laughed as we imagined Dan passing out at the donut cabinet, unable to ever eat his donuts as his blood sugar dropped. In any case, more sciencing to be done. My blood sugar did exactly what I expected. I probably peaked somewhere between 10 and 11 at 45 minutes. Dan’s blood sugar has no possible explanation except that his pancreas stores a lot of insulin, because his blood sugar went down from his baseline! I will look into this. My blood sugar was exactly on track, but Dan’s is back up a bit. So, I finally beat Dan to a lower blood sugar. I am happy to be under 5. The time between the last 2 measures was closer to an hour and a half than 2 hours btw. So, what do we know. First the 2 meals head to head. The blood spike difference for me was significant. I spiked up to 9.8 on the carb meal (donuts) after one hour as opposed to 7.0 on the balanced meal. Again, at 2 hours, the carb meal was still higher, 7.0 as opposed to 6.5. The time to clear the sugar was quite different though. I had a blood sugar under 5 within 4 hours on the carb meal, but it was still 5.8 on the balanced meal. I did get some activity in between the blood measurements on the carb meal, so that could have caused the better sugar control. This is definitely one of the next experiments. Dan and I will eat the control meal (2 Sausage Egg McMuffins and a large coffee) and then do periods of exercise in between. I recommend we do 15 minutes of cardio each hour. A future experiment can be 15 minute High Intensity WODs instead and see the effect of high intensity exercise compared to cardio. Dan had a different outcome, but that can probably be attributed to his insanely high fasting blood sugar. Dan’s 1 hour peak was higher with the balanced meal, 7.3 versus 6.9. Still his highest peak was less than his fasting blood sugar on carb day. As well, Dan cleared his sugar much faster on balanced meal day, within 2 hours he was down to 5, but this took 4 hours on the carb meal. Dan peaked at 7.3 at 3 hours on carb day. So, it is hard to get a sense of the data with our size of subject pool and variability of circumstances. Until we measure the effect of exercise on blood sugar, the data is inconclusive. I am very interested in how long it took to clear the sugar out of my blood on the balanced meal day. It will be interesting to see if that was a case of lack of exercise or if there is something in that meal that keeps impacting my sugar load in my blood. Still, the higher magnitude of blood sugar measurements on carb day are impossible to ignore, especially when seen on a chart. When the balanced meal is graphed you can see that Dan’s blood sugar, although getting out of a healthy range, looks like what blood sugar should. Mine, not so much. The reduction from peak is an almost linear path. The carb day went exactly as I had expected for myself, but I was surprised that my blood sugar was as low as it was at the end of 4 hours. As well, the balanced day went exactly as I expected for Dan and pretty much matched the results from the day he did the 7-11 egg muffins. The initial high readings on the carb day have me confused and intrigued, especially Dan’s. When graphed, my blood sugar looks exactly like it should, although insanely out of the healthy zone. 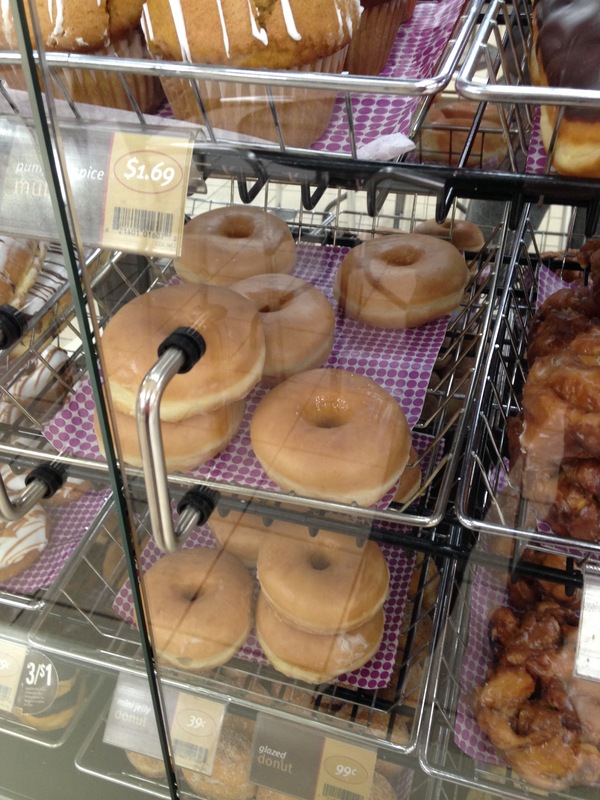 Clearly 3 and 1/2 glazed donuts are out for me… forever. Dan’s blood is bizarre though. Apparently there are 2 major doses of insulin that the pancreas secretes after eating. A huge one that brings down the big spike and then about an hour later a smaller but significant dose that brings blood sugar back to normal. Both curves would support that. Certainly mine does. If Dan’s first dose of insulin occurred when he was fasting in response to extraordinarily high blood sugar, then he may have peaked at around 8:15 dropping quickly down to 7 at 9:05. Still with so much sugar he may have rebounded at 10:15 and the next dose of insulin brought him down. Just a theory. So, the next phase of this experiment should be to test both of those meals again at exactly half of the calories. I anticipate that we will see similar but less pronounced results. This should give us all of the data we need to determine carbs versus calories and move on to see what the immediate effects of exercise are on blood sugar. It will also help me to determine how large of an unhealthy meal I can eat and not risk future diabetes. What causes my blood sugar to rise out of a healthy zone? Meals with too many calories (exceeding 500 calories in a sitting)? Meals with too many refined carbohydrates (total carbohydrates minus fiber, where this number exceeds 40% of the total grams of the meal)? Or a combination of both? Also, does someone who trains and exercises on a regular basis have a better ability to keep their blood sugars in the zone? I am going to combine 2 experiments into this one, maybe more… who knows, but last week my trainer and friend Dan came into the office (my gym is right across the street). He had just bought breakfast, 2 7-11 breakfast egg sandwiches, one bacon, one sausage. I suggested that those were horrible for him: too many carbs and way too many calories. He disagreed and then downed them like a pro. His fasting blood sugar was 5.1. He peaked at 8.4 one hour later and then dropped to 4.2 by 2 hours. I am not saying that 8.4 is particularly good, but 4.2 at 2 hours!!! We agreed to try this head to head. My hypothesis is that the carb load of a meal will be the main determinant of my blood sugar reading after eating. I know this sounds simple, but I will be using the outcome of this research to determine just how much of a carb load I can handle and stay in my healthy blood zone, so this is a first step and a necessary one. It doesn’t help to take assumptions forward in science. The more fun hypothesis is that I believe Dan, a trainer who works in the gym and trains every day will have a better blood sugar reaction to all of these meals than I will. I only work out 2-3 times a week and have always struggled with weight gain. To be clear though, Dan eats a lot and can easily gain weight despite his workouts, so he may not be the perfect trainer example, but he is in on the experiment. This experiment is in 2 parts. Part 1: We will eat a meal with a relatively balanced carbohydrate, protein and fat ratio. Using the Zone diet as the guide, an ideal meal would be 30% fat, 30%protein and 40% fat. We will test our blood sugar at 1 hour intervals, starting at fasting right before the meal. Part 2: We will eat a meal with as poorly a balanced a carb to protein and fat ratio as we can come up with without it just being cake or a cookie. We will again test our blood sugar at 1 hour intervals, starting at fasting right before the meal. The calories of both meals will be identical or nearly identical. The head to head breakfast sandwich combo seemed like a good starting off point, but as I pointed out to Dan, I would never eat the breakfast sandwiches from 7-11… Never, not even drunk. So, we agreed upon 2 Sausage and Egg McMuffin’s each. Those I will eat… mmmmmm…. (By the way, many people have noted that I must be loving these experiments as they are giving me a reason to eat obscene amounts of food. I have never eaten 2 of these McMuffin’s at one time before). This morning I purchased the McMuffins and we went head to head. 2 Sausage and Egg McMuffins Each. Above is the nutritional information for our meal. You will note the breakdown of macro-ingredients is 26% protein, 32% fat and 42% carbohydrate. Shockingly, the Sausage and Egg McMuffin is not far off of the ideal Zone meal! The calories for 2 of these things is way too much for a meal. As you know I recommend that all meals are under 500 calories and that you eat 4 meals a day. 1 is fine, but I can’t imagine being full after eating one of these calorie bombs. So small, but so full of salty, delicious flavour. Stuff your face, wash it down with coffee (yes, I know we didn’t mention coffee in the equipment because we are bad scientists and because COFFEE!! – for the sake of science, 2 large coffees, Dan’s was black, mine had milk). 1 McMuffin was amazing… just amazing… the first part of 2 was almost as amazing… the second part was a little much. There was definitely a diminishing marginal return on the end of the second McMuffin. Still we powered through (I don’t think Dan felt that diminishing marginal return). Fasting blood sugar: You would think this was important, but I forgot the blood meter at home so we went without our fasting numbers. I did go get it before the first hour test though. Yes, I know I am a terrible scientist… I am going with 5.0’s for both of us. So far so good. Looks like I have a better pancreas than Dan!! Sure he can deadlift about 500 more pounds than I can, but my pancreas is in the lead!! What?!?! Didn’t someone tell Dan’s pancreas that this was a marathon, not a sprint!?!? My pancreas is totally dogging this race. Within 2 hours Dan has totally removed the evidence of this massive meal from his blood. I had to go to a job site, so I left Dan out of this reading, but who needs him, his blood is already back to normal. Still not good at 3 hours. So, nothing particularly illuminating in the results so far. First, 64 grams of refined carbohydrates are probably too much to be eating in one meal and the blood sugars definitely spiked as a result. Still, nothing too bad. The meal was very filling. I have noticed this pattern of it taking a long time for the sugar to get out of my system. This has me a little concerned. I will have to look into that. Still, so far, the second part of the experiment has definitely been informative. Clearly Dan is much more able to get his blood sugar under control faster, as measured by time to get back to under 5.9 mmol/l. I wonder if any of that has to do with the fact that he was in the gym for the 2 hours, walking around, grabbing equipment, etc (but not working out). That is a future experiment. I will eat this meal again and walk for the whole time in between testing… Maybe to close the loop we can get Dan to sit for 4 hours. For part 2 the foods have been decided. I suggested that we eat 870 calories of hashbrowns because they are much higher in carbs/starches and because there is a poetry to having the other half of the experiment as the other half of a breakfast combo. Also, wouldn’t mind ordering 11 hashbrowns. Dan said something about donuts. We discussed the options but Dan couldn’t say anything but donut. He wants 7-11 glazed donuts. They are 250 calories each. He will have to eat exactly 3 and 1/2 donuts to get the same calories as the meal above. It will have 38.5 grams of fat, 119 grams of carbohydrates, and 10 grams of protein. 22% fat, 71% carb and 7% protein. Seems to fit the bill. I am going to go a different way. I am going to get McDonalds french fries. I am going McDonalds again because I think it is important to eat in the same restaurant if I can. I also dropped the hashbrowns as they aren’t as high in carbs as fat! They are insanely high in fat. (only 77 grams of carbs in meal with 55 grams of fat). Also I suspect the french fries in the crazy McDonalds high blood reading I had last week so I would like to follow up. I will eat 1 large fries, 1 medium fries and 6 packets of ketchup (which I don’t think will be enough ketchup sadly). This will be 860 cals, 39 grams of fat, 111 grams of carbohydrates (121 – 10 grams of fiber) and 10 grams of protein. 25% fat, 69 % carb and 6% protein. Almost identical to Dan’s meal. A couple of things to note here. First, a large french fry is the macro-ingredient equivalent to 2 glazed donuts. I find that bizarre. The other thing that is important and worth a future experiment is that they differ almost exclusively in the sugar content. The donuts have 40g of sugar. The fries none. Is sugar better for your blood sugar than potato starch? I wonder. I bet it is though. We might live blog our results… who said science was boring… oh ya, that was me. I will add a link to Part 2 here. For information on blood sugar readings and why I am doing this, click here. I have done forty or so readings so far. I know that I am terrible at remembering to follow up on my readings, but I haven’t failed to do so every time. I have several complete readings, but most of my readings so far have been fasting. I know that isn’t great, but it isn’t bad. I have eaten a bunch of reasonable healthy meals and rarely follow through to 2 hours. I have also eaten some classic fast food meals and taken measurements as well. I ate a Subway tossed vegie salad and a 6″ Italian BMT on wheat. My blood sugar before eating was 5.3. At one hour it was 6.4 and at 3 hours it was 5.1. Surprisingly good. On Nov. 13th I ate a steak and caesar salad that was made at home. Fasting was 4.7, at one hour was 6.5, at 2 hours was 6.8 and at 3 hours, 4.8. Odd little blip there, but overall, pretty good. On Nov. 14th I ate a Tim Horton‘s Breakfast Sausage Biscuit with cheese and egg and a small hashbrowns. Fasting 5.5, one hour later 7.0. For breakfast last week, I was Fasting 4.9 and ate an eggs benedict with a few hashbrown potatoes from Earl’s. One hour later I was 5.8. Nothing scary so far, but the week early I got this measurement and it scared me badly. I ate a McDonalds Quarter Pounder with cheese, medium fries and diet coke and I went from 5.1 fasting to 9.0 at 45 minutes, to 10.1 at 1 and half hours and dropping to 6.5 at 2 hours and fifteen minutes!! I couldn’t find the healthy zone if I tried! What scared me was that the meal didn’t appear that bad to me. I almost never eat french fries any more, but I sometimes get the whole meal. I wonder if it was the fries that put me over. Later in the week I tried to eat just the sandwich. I ate a Quarter Pounder with cheese, nothing else. Pre-meal 6.0, 1 hour 7.0, 2 hours 6.4. Not great, but infinitely better than the meal. I wonder if the diet coke played a role. I will have to test that. In any case, I tried the burger alone again and got another 7.0 at 1 hour. Also during the last 2 weeks, I ate 3 slices of Fresh Slice pizza, cheese with hot sauce on top. That is not a lot of pizza, but one more slice than I usually try to get by on. 2 slices always leaves me hungry. My blood sugar was 5.2 at fasting, then shot up to 9.8 after one hour and dropped to 7.5 after 2 hours. Again, terrible numbers. So, it does seem pretty clear so far. The carb load of a meal clearly effects my blood sugar. The 3 slices of Fresh Slice clock in at just over 850 calories with over 108 grams of carbohydrate in the form of flour and sugar. The Quarter Pounder with Cheese meal was 860 calories with 87 grams of carb, again all flour and sugar. I don’t know why the McDonalds meal effected me so poorly, but my guess is that Freshslice just isn’t very accurate with their nutrition information. The pizza seems awfully flimsy to have 108 grams of carbs in it. Still, it could be the calories. The meals were pretty even in calories and carbs, with Fresh Slice having the edge in carbs and McDonald’s in calories, so that would support the calories angle. The subway meal was a combination of the BMT which was 410 calories of which 46 was carbohydrates. Of that 5 grams were fiber. The salad was 190 calories of which 13 grams were carbohydrate, only about 7 of which were refined and 3 of which were fiber. So, I will directly deduct the fiber and we get a total of 600 calories total and 51 grams of carbohydrate. These findings support both possibilities, or the possibility that it is a combination of calories and carbohydrates that raise blood sugar. So, we have an experiment brewing. In fact, I think I am going to take on 2 at the same time. Get ready for the Round 1: Calories or Carbs. I have had my fasting blood sugar tested on several occasions, most recently a few months back. I hadn’t been in the gym in a few months (so far my longest break from the gym), and I was getting exhausted after eating meals that were less than healthy. My doctor wanted to test to see if I was diabetic. This wasn’t the first time I had had this test done and it always comes back fine. So on September 14, 2015 my fasting glucose was 5.0 mmol/l (to convert to mg/dl go here). Not perfect, but within the range of normal. I have always been suspicious of the fasting glucose test because I am more curious as to how my body deals with foods shortly after I eat, not after 12 hours. I feel fine in the morning, but tired after a big meal… what is going on that is making me tired? I have been thinking I should get a blood glucose meter and test myself for quite awhile. I finally decided to do just that. My doctor suggested that this may be a waste of time. The pharmacist I purchased this device from had a very similar, although much stronger opinion. I am going to shorten the comedy of errors that was my learning process to determine when to take blood sugar readings and what those readings should be in non-diabetics. The key times to take blood are before eating (first time of the day is your fasting), 1 hour after, 2 hours after and in some cases 3 hours after. Here is a graph of blood sugar readings taken on the hour in healthy adults. It was created as part of a study that can be found here. The main thing to see in the chart is the average glucose concentration in the blood. That is the blue line that starts at about 4.4, tops at about 7 at about 8:15, 45 minutes after eating, and then drops quickly to about 5 at 10:00. That is what a healthy blood sugar reading should be. There is a pretty good website that helps a healthy person determine what their blood sugar readings should be and why. It is here. Under 120 mg/dl (6.6 mmol/L) one or two hours after a meal. Most normal people are under 100 mg/dl (5.5 mmol/L) two hours after eating. This is demonstrated by the graph at the top of this page, which shows the blood sugars measured during a study where normal people had their blood sugar sampled every few minutes after eating a high carbohydrate meal. 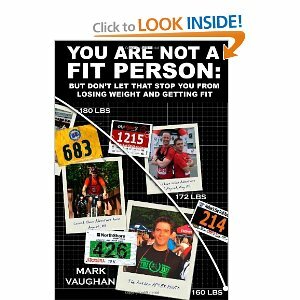 I believe these numbers are actually really important to everyone who wants to be fit. I believe that unfit people who are not diabetic may run into blood sugar problems due to poor diet choices or lack of exercise. The website I listed above and others, although directed at diabetics talk about using your blood sugar to find foods that you shouldn’t be eating and eliminating them from your diet. I think this part of the actual science behind the Zone diet (and pretty much every effective diet created after the Zone diet is based on the Zone diet). In the book, if I remember, Dr. Sears talks about how you can tell if you are reactive to refined carbohydrates. I think he probably mentions a test, but recommends just looking in a mirror. The gist of it is, if you are overweight, you probably have a problem with refined carbs/starches. So, it is my theory that there is a continuum of effectiveness of insulin efficacy and it runs from perfect to diabetic. I believe that at least a large subgroup of unfit people fall just outside the diabetic zone. Part of this, I believe, manifests itself in that unfit people eat meals that push their blood sugar out of the optimal zone. They do this regularly and these are the food items that they shouldn’t be eating. I think this can be measured using a blood sugar monitor and I intend to try. It is quite possible that this has already been proven in general, but I would definitely like evidence on what pushes my blood sugar out of the zone. I have so many questions though… does mixing up the order of what you eat help? Ie. If I ate a salad first, or ate my vegetables before my refined carbs/starches. If it does, how much time should I leave between vegetables and refined carbs? How do overall calories effect your blood sugar? Is blood sugar effected almost exclusively by overall carb load in a meal? Does walking after eating bring your blood sugar down faster than sitting? How about exercise? If I ate the same thing at the same time as a healthy person, how would our blood sugars differ? Does diet pop effect your blood sugar after eating? (I am beginning to try these experiments, so if the question is in the form of a link, you can find the results there). I am sure this is only the tip of the iceberg in terms of questions that I have. I am going to create some simple experiments to try to answer some of these questions. I have had the meter for a few weeks and one problem is that I almost never remember to test my blood 3 times in a row on the hour. I will shoot for before meal, one hour, and two hours… sometimes I will get the 3rd hour. I might need it, judging from some recent readings. Jillian is taking on the business side of the fitness industry. In their search for the next workout phenomenon, Jillian and fellow judges, TRX founder Randy Hetrick and celebrity trainer Obi Obadike, will meet twenty-seven fitness entrepreneurs from around the country. The contestants will try to convince the judges that their exercise program has the most business potential. In anticipation of the October 20 premiere of Sweat Inc. on Spike, Jillian answered a few questions about her experience in the fitness industry and what we can expect from her new series. As most of you know, I have had issues with Jillian in the past. Mostly based around her partnership with Giancarlo Chersich. I find the man to be a bit of a dumbass. Watching these two discuss their strategy is painful. Agonizing even. I love how the pill pushing didn’t even come up as one of the largest failures for her. Just watching them together, knowing that Giancarlo is leading the team makes all of her miscues and failures make sense. In any case, I am quite excited about this new show. I hope she sticks to the ‘tough’ trainer persona through this show and doesn’t try to push her other products. In the new Spike reality-competition series Sweat Inc., hosted by Jillian Michaels, twenty-seven aspiring fitness entrepreneurs compete to prove they’ve developed the most groundbreaking and effective exercise program out there. In the end, only one will have the business savvy and innovative program to land them $100,000, a feature in Women’s Health Magazine, and the opportunity to launch their fitness empire with Retro Fitness. I am quite excited to watch this show, and very excited to see what these entrepreneurs have come up with. So many cool options. I am hoping for some Crossfit variations! I saw some obstacle race thing, and I am pumped for that! I would sign up for that today!! I am thinking of doing Battle Frog this year, and still going to go for the Spartan Trifecta in 2016. In any case, it is on Tuesday October 20th, on Spike TV at 7:00. Check it out!! Let me know what you think of it. Is anyone else excited for it. I due find it odd though that the article is actually sponsored. This stuff scares the crap out of me. Just so you know, my post is unsponsored… yep free advertising. I guess that won’t be happening for very much longer. You are welcome Spike TV. I am actually floored. It has taken me a couple of days to get this post made as there are 3 extremely important stories that should have come out of Senate’s consumer protection panel that dragged Dr. Oz over the coals for his role as a snake oil pitchman (I don’t say salesman as he claims he does not make any money off of his recommendations). This story is probably the most important because it is points out the bizarre, and almost unbelievable laziness of the main stream press. After the Senate’s panel there are thousands of stories posted to the internet, each with their own rewording of the same story. Each one parrots back the official story, with the same quotes and the same main points. I doubt any one of the journalists watched the entire video of the panel. But now, after a congresswoman chastised Dr. Oz, in much gentler words than I have ever used, it seems that for millions of people, Dr. Oz is clearly feeling the heat for his over the top claims of products. That is the official story. It is missing the depth of incompetence that Dr. Oz has sunk to in including psychic healers and anti-vaccine nuts as legitimate health care providers. It is missing just how bad Dr. Oz’s claims have been, only glancing at the problems with his green coffee bean claims, but missing the entire part of the segment that includes Dr. Oz interviewing a fake doctor to support false claims of weight-loss on green coffee beans. Yes, the entire story was fabricated, most likely by Dr. Oz and sold to the public with a person who claimed falsely to be a doctor. Lindsey Duncan, who goes by the name, Dr. Lindsey was portrayed as a doctor while presenting to the Dr. Oz show the benefits of green coffee bean extract. In what appeared to be an infomercial for a company selling green coffee beans, Dr. Oz and Dr. Lindsey went on to give fallacious answers as to what to look for in dosage and timing of pills in what clearly appeared to be an attempt to market a specific brand of green coffee bean extract. Within weeks of Oz’s comments about green coffee — which refers to the unroasted seeds or beans of coffee — a Florida-based operation began marketing a dietary supplement called Pure Green Coffee, with claims that the chlorogenic acid found in the beans could help people lose 17 pounds and cut body fat by 16 percent in 22 weeks. The company, according to federal regulators, featured footage from “The Dr. Oz Show” to sell its supplement. Oz has no association with the company and received no money from sales. The FTC has brought a legal action against a company that is selling green coffee beans, about $15 million dollars worth from some estimates. This company came into being just weeks after the show came on. Their website and their ads show clips from Dr. Oz’s show. They don’t say that he endorses their products, but they do use the information that was presented on the show. This information is incorrect and would not stand up to scientific scrutiny. Dr. Oz and Dr. Lindsey Duncan still felt it was okay to share this information with the public, but it is apparently a crime to sell a product using these claims. If you go to the FTC and read the complaint against this company, there is no claim that their product is substandard. In many of the articles, journalists complain that the price for them is exorbitant, but it is actually the going rate for magic beans. The crime that they are guilty of is using Dr. Oz and Dr. Lindsey Duncan’s claims to sell their product. Additionally, they have several fake news sites that they use to help sell their magic beans, and this may be the magic bullet that will put them out of business but it is ironic because the more sophisticated con had a real news site (Dr. Oz) help it sell its product. I am sickened by these companies that come into being and take advantage of the dimwitted Dr. Oz. Still, this is nothing compared to what the real crime should have been. Dr. Lindsey Duncan, who has shilled his products before on the Dr. Oz show, already owned one company that was already selling Green Coffee Beans on the internet before the show aired. He actually started another company in his wife’s name and launched it just weeks BEFORE the broadcast of the show. He has sold much more than the $15,000,000 of Green Coffee Bean Extract, and he actually misled the public about the dosage so as to give an advantage to his product in the marketplace. Further, he endorsed the sale of his product without informing the public at the time that he was selling the product and had no shortage of conflicts of interest. All of this is very apparent to anyone who does any research. It would only take a few minutes of watching the actual green coffee bean show and then doing a few minutes of research to find out that Dr. Lindsey Duncan has an illegal PhD from a school that does not exist any more, a school which has a startling number of criminals who also claim the honorific of doctor from the same school (feel free to research the Clayton College of Natural Health). It also takes seconds to find out that he sells green coffee beans. It takes more time to find that he created at least one additional company in a different state to increase the volume of product he could move, but that wasn’t the hardest thing in the world. Still, not one report covers this. It only covers the public announcement that included the green coffee bean company that started a few weeks after the show aired. Dr. Oz goes on to suggest at the panel, that his biggest failure isn’t his use of the world miracle, or his misreporting of shaky scientific findings of products, but instead that he should be recommending sellers that he trusts. He apparently trusted as an expert, a fake doctor and presented this man to the world as a doctor. He doesn’t even see the irony of this when he is talking to congress about including his experts in his shows as if this gives validity to his false claims when he seems incapable of even vetting his experts. Of course, if journalists were paying attention, something very interesting is happening over at the companies that Dr. Lindsey Duncan works for. Genesis Today has removed any and all mention of Dr. Lindsey Duncan from their website. At the same time, Dr. Lindsey Duncan has removed any and all use of the honorific Dr. from his websites. All of the mentions have been scrubbed of the words Dr. This has just happened in the wake of the lawsuit against the Florida green coffee bean sellers. I wonder what is up?